Yesterday, I spent a sunny day in the summertime nature, taking photos of landscapes and countryside mostly. At the end of the day, when the sun was still shining, I decided to take some self-portraits, or call it - by these day's popular term "selfies" if you want - of myself to update my visual online identity on my website(s), social networks and other online profiles where I have my portraits displayed to the public. Another reason why I decided to take some up-to-date photos of myself is because I plan to write some articles here on my personal blog and other websites, which I am developing recently, where I want to talk about the ways how I take my photos, how I do software post-processing on them in the computer, as well as about other aspects related to this field, such as photography equipment and other stuff. 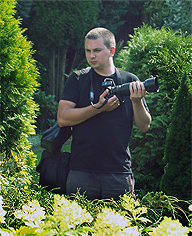 These articles should present the ways how I personally do my photography works and thus it is more than natural that they should be accompanied by illustrative pictures of me in poses related to things I will talk about in the text. Besides of these illustrative photos, I took also some portrait shots of myself with my camera in hand of which one I am attaching here to this post, so you can judge for yourself. 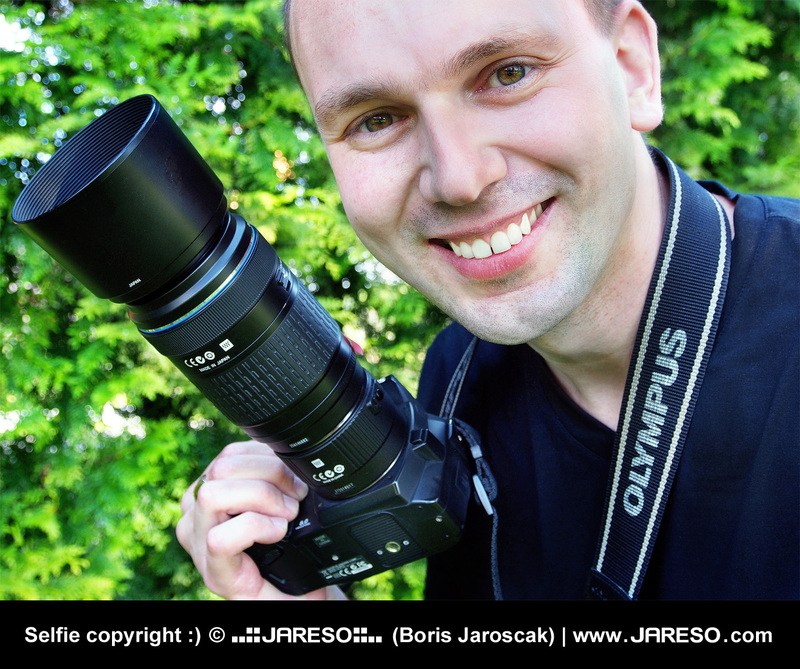 It is a self-portrait where I hold my Olympus E-500 DSLR. As some of you already know, I am a very proud user of Olympus 4/3 DSLR and M4/3 mirrorless system and thus I made sure Olympus logo is visible on camera belt around my neck. I will use this photo here on my personal portfolio website in the section named "equipment" where I talk about current photography equipement I use. I plan redesign of that section soon to much more informative version of what it is now. Some of you are perhaps wondering how I actually managed to take these self-portraits?! As I already mentioned, I am a proud user of Olympus systems and because of that I currently have two cameras. One is Olympus E-500 DSLR, I am using since 2006 and the other is mirrorless Olympus E-M5 (OM-D), I bought in 2012. So while holding one of them in the hand, I used the other one to capture the photos. It was not easy and I actually found it much more challenging than to take portraits of someone else from position behind the camera. But it was also a kind of fun! The whole procedure went like this: every time when I wanted to capture one of those self-portraits, I have chosen the target scene first and I properly imagined how the resulting picture will perhaps look like. Then I prepared and mounted the other camera on tripod, setting it on aperture priority, zooming approximately to a location where I imagined myself posing, with spot metering and point-autofocus, targeting to the area where I guessed my head should be. I also set camera‘s self-timer to a 2 seconds of delay, but I didn't used the shutter-release button on camera to take these self-portraits, instead I used Pixel TW-282 wireless remote device to control the camera. This is indeed a great device that I always use when I take pictures form the tripod, mainly to eliminate shake caused by shutter-release button and now it proved to be very useful also during my self-portraits session. When everything was set, I went from behind of the camera to the front, where I struck a pose in front of the lens with my head approximately at the location where I knew point-autofocus is targeted. Then I half-pressed shutter release button on wireless remote control, autofocusing the camera where expected. After camera beeped, letting me know that everting is OK, ready and prepared, I full-pressed remote's release button to finally capture the image. Because the camera's self-timer was set to a 2 seconds of delay, it gave me some time to hide wireless remote control to my pocket, drop in on ground or otherwise get it out of a frame. And that was pretty much it, choosing the location, setting the camera on tripod, striking a pose and pressing the shutter release button on wireless remote device and than repeat all that again and again, striking various poses and changing sceneries behind. So far 10 people commented this article! Hi Boris it's Deserae I love your photo it's cool✋? Hey Boris can we be friends? Hi Boris I'm Deserae can we be best friend forever? Milý příteli, přeji ti hodně krásných fotek.